Mike Ullery | Daily Call Steve Greggorson, top center, of the John Johnston Farm & Indian Agency, teaches Piqua Central Intermediate School fourth-graders about life on the Miami & Erie Canal as they travel aboard the General Harrison canal boat during their visit to the John Johnston Farm on Tuesday. 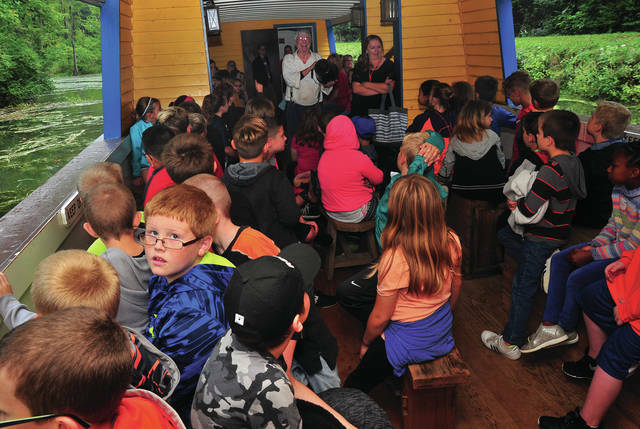 Steve Greggorson, top center, of the John Johnston Farm & Indian Agency, teaches Piqua Central Intermediate School fourth-graders about life on the Miami & Erie Canal as they travel aboard the General Harrison canal boat during their visit to the John Johnston Farm on Tuesday. https://www.dailycall.com/wp-content/uploads/sites/30/2018/09/web1_092518mju_pcis_johnstonfarm1-1.jpgMike Ullery | Daily Call Steve Greggorson, top center, of the John Johnston Farm & Indian Agency, teaches Piqua Central Intermediate School fourth-graders about life on the Miami & Erie Canal as they travel aboard the General Harrison canal boat during their visit to the John Johnston Farm on Tuesday.